The Wesleyan Chapel was built between 1866-68 at the height of religious fervour in Ossett. It was said to be the third largest Methodist chapel in England. 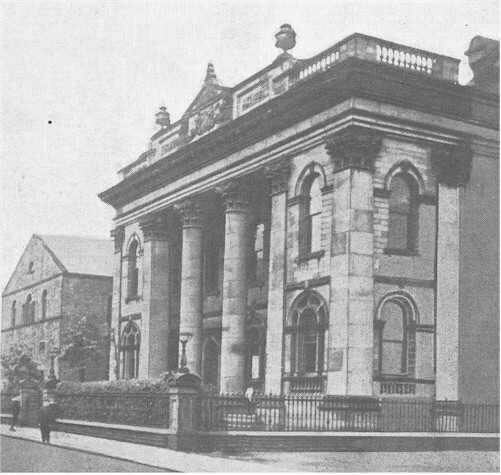 The chapel had a fine classical facade, which faced out on to Wesley street with the other three sides having a rather plain appearance. The Wesleyan Sunday School built in 1825 can be seen beyond the Chapel. This fine building was demolished in 1961 and a rather gauche 1960s style Methodist Church built in its place. My G.G. Grandfather, James Wilson (1821-1884) was a long time Trustee and lifelong supporter of the Wesleyan Chapel. Wesleyan Methodism in Ossett dates back to the 1730s and the work of Ossett man, Benjamin Ingham, a pupil of Charles Wesley at Oxford. In 1778, the first Methodist chapel was opened in Ossett, comprising two simple dwelling houses at numbers 32 and 34 Prospect Road. In his only recorded visit to Ossett John Wesley preached at the chapel on April 24th 1790 in his 87th year, his text being 'Philippians iv, 7'. John Wesley died the following year.